And a big thank you to everyone who stopped by to wish me well on my launch last week. The last seven days have really been a whirlwind of getting to know new readers and other bloggers through reading, commenting, subscribing, tweeting, and otherwise being sociable from my little corner of the world — and I’ve loved every minute of it! I’m really looking forward to becoming a fixture in the kidlit blogosphere and hanging out with all you fabulous people. See you in a couple days with another Poetry Monday video! 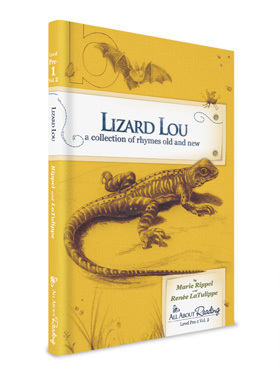 Lizard Lou: a collection of rhymes old and new to three of you! Co-authored with Marie Rippel of All About Learning Press, Lizard Lou is a 112-page read-aloud book of children’s verse featuring 43 new poems by yours truly and 35 traditional rhymes and poems, curated by Marie, by renowned children’s poets including Leroy F. Jackson, C. J. Dennis, Vachel Lindsay, Ralph Bergengren, and more. There’s even an Emily Dickinson in there! That’s a loaded question, but in a nutshell, I’m a full-time freelance editor and children’s writer who thus far has co-authored several volumes of early readers (see the PB Library for more info) — and I LOVE it! Between readers, I’m branching out to try my hand at traditional picture books. And because I’m a verse writer by nature, I’m going to force myself to write in prose and see how it goes. (Darn! You see?) Butterflies! Other weird tidbits are available on the About page, if you’re so inclined. What does “No Water River” mean? That question is best answered in my first angst-ridden post about an ornery poem. As the tagline says, I’d like NWR to be the picture book and poetry place where kids and parents can find great books and have some fun with poetry, too. 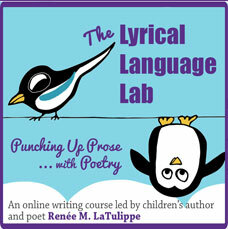 To that end, the blog is anchored by Poetry Monday and Perfect Picture Book Friday. But I’m also a writer with particular experience in verse, so I’ll be blogging about that, too, and offering resources and exercises for those of you who’d like to brush up on your rhymin’. Monday: Poetry Monday featuring my video poems and activity sheets. Tuesday: Open. I often blog on language and grammar at All About Learning Press on Tuesdays, so stop on by! Wednesday: One-Word Wednesday for writers and illustrators. Launching next Wednesday, January 11. Stay tuned! Thursday: Wild Card. Reserved for posts on writing, poetry, the 12×12 challenge, and other writerly things, or for interviews, blog roundups, and special features. I have things up my sleeves! 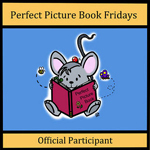 Friday: Perfect Picture Book Friday, a picture book review event hosted by Susanna Leonard Hill. Weekends: I shalt resteth and tapeth my poetry videos on the weekends. And now back to the giveaway! This is a Rafflecopter thingy, which means it’s all automated and there are several “tasks” to choose from, from subscribing to the blog over in the sidebar to commenting on a poetry video post like If I Were an Ocelot. Sign in to the Rafflecopter widget with your name and email. This is the only way to be officially entered into the giveaway! You will see a list of tasks with big green buttons next to them. Click on the ones you want to complete, and follow the instructions. The more you complete, the more times your name goes in the hat to increase your chances. Nifty! IMPORTANT: You must sign in with your email to the Rafflecopter widget below in order to be “officially” entered into the giveaway! The giveaway is open until midnight next Friday, January 13 (spooky! ), and I’ll announce the winners the next day. Good luck! Dave LaTulippe (yeah, that’s my bro!) and Jeff Sarris of SpyrMedia, who not only donated my lovely banner, but who also cheerfully bailed me out of several non-techie-fiddling-with-code meltdowns along the way. Thanks, all you wonderful people! And thanks to all of you for stopping by. Feel free to snoop around, drop me a line, whatever you like. I look forward to getting to know you all! Poetry Monday: "Jake the Snake"
Wow! This is a great site, Renée. Good luck! And thanks for the giveaway–that book looks wonderful. BTW, Renée, I Liked your fb page and subscribed via email (so far!). Hi, Renee! I’m delighted with your new blog — you’re off to a fantastic start. Poetry holds a very special place in my heart, so I will be reading your posts with joy. I am working my way through all the “things to do” in the contest — so far I’ve subscribed, posted on my personal FB page and my author page (which automatically tweets on my author twitter @lizannewriting) and I will put you in my blogroll on my new blog. I see you have my old blog in your blogroll — thank you for linking to me! My new blog, By Word of Beth at http://www.bethstilborn.com is now up and running, and elizabethannewrites will now be a static archive. Best of everything in your new blog venture, and in your writing projects! Update — I’ve done them all! 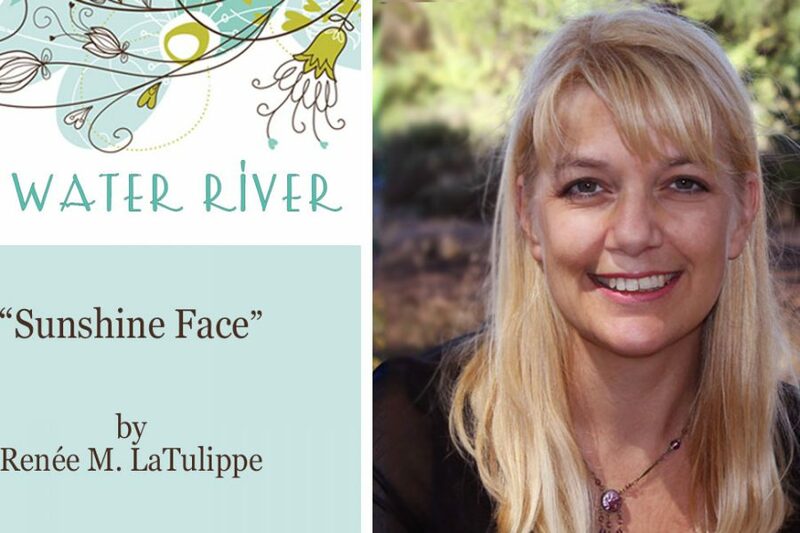 I added my author facebook page name in the space after liking your facebook page. Thank you! You are off to such a good start over here! I love the graphic at the top! Congratulations on starting your blog. You are off to a great start. I write in verse and prose and I am always looking for ways to improve both so I will be back. Thanks for stopping by, Alison! My brother Dave designed the banner, and has also illustrated quite a few of my stories in the readers – I just love his style. I definitely hope you come back for the One-Word Wednesday writing challenges — more about that next week. We’ll have fun! Sounds marvelous! So great to meet another SCBWI France member! Ooh, Jenna, nice to meet you, and thanks so much for tweeting the giveaway! Any chance you’ll be heading to the Bologna book fair this year? Would be great to meet some of you in person! I knew we should hang together for a reason! But now that I said I was going to force myself to write in prose, I’m not so sure…it’s giving me writer’s block! I know all the agents say “Don’t write in rhyme”…but if that’s what I do, that’s what I do…I mean, what can I do? Haha. Anyway, you can help me out on One-Word Wednesdays then — we’ll tawk. BTW, did you enter the giveaway? I don’t see you in there — don’t be left out! Ah writer’s block….I know it well…That and trying to squeeze in a few sacred minutes of writing time during a seemingly shorter nap time, just isn’t working out for me! I’m not sure if you read my response on my blog–but I think maybe prose combined with poetry may be a great fit for you. A repeating line of poetry? A refrain of dialogue that the main character speaks? etc. This is how I envision my prose will be, at least. Funny you mention prose mixed with poetry…that’s what I did in my story “Queen Bee” in the book of the same name. The bee has an identity crisis and travels the world looking for a better life, but she’s the only one who speaks in verse. And actually, 99% of what I write for the early readers is prose…so what am I talking about? HA! But readers are vocabulary-controlled things, so writing in if writing them in prose is difficult, writing them in verse is that much harder. BTW, it doesn’t matter if you’re an unpublished writer — so am I if we’re talking traditional PBs and publishers. We’re in the same boat. Being published has nothing to do with the ability to dispense good advice! I’m so excited to see you here, Julie! You and Susanna really inspired me this past month with your dedication to the PB writer community, amazing enthusiasm, and supportive ways. Just following in your footsteps :). Thanks so much for doing all that stuff — you rock! Congratulations on your launch. It’s nice to have someone who knows about poetry and rhyme to connect with. It terrifies me. So, I will certainly enjoy reading your posts. I too would love to win one of you books — am very curious. Loved your Ocelot poem. Thanks for stopping by my website. I focus on books for kids with special needs, multicultural, racism and so on. Best of luck. Glad you’ve joined PPB. Thanks for stopping by, Patricia! Actually, the readers I’ve co-authored with Marie Rippel (who is an expert in teaching spelling and reading to struggling students) are carefully crafted to be user-friendly for kids with learning difficulties. If you want to brush up your rhyme, stop in next Wednesday for the One-Word Wednesday rhyme exercise – would love to have you join in! Great blog! I read some samples of your books and I love your poetry. I am sending Lizard Lou to my 21 month old grandson Zachary who loves to be read to. Wow, Pennell, thank you so much! So great to hear from you — you’re in Mexico now, right? Can’t believe you have a grandson — and he’s practically the same age as my boys, who will be 22 months in a couple days. Congrats to you too, then! Please stop by again, or I’ll see you on FB! Beautiful website and video! I will check back again when I have a little more time to enjoy it further. I just wish that Jeff was little again! Terri, it’s so nice of you to stop by and to finally “meet” you. I’ve seen you plenty on FB! I’m guessing it’s been a long time since Jeff was actually “little,” though, hehe! Look forward to your next visit! I think it’s great you shared how one thing led to another great thing in your writing. The book sounds lovely. Your rhyme is divine, so why force yourself into prose? So says the writer, who has been told not to force a rhyme. 🙂 I believe I did everything in the giveaway. I followed you on FB. I posted you on my Resources page of my blog. I commented on your Sunflower post (but was unable to hear the audio). I really like your activity sheet for the poem. I posted a link to the giveway on my “fan” FB page http://www.facebook.com/StacySJensen I think I visited the wrong video post. I’ll correct that … Good luck with your site and writing. 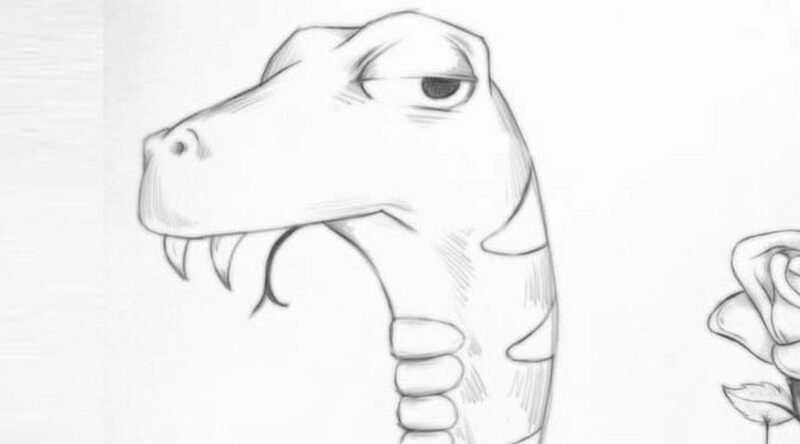 I just have to say that the people who are leaving two comments in the guise of “and I forgot to tell you” are cheating and should be disqualified from the drawing! Oh and I forgot to tell you that I’m going to buy the Lizard Lou book for my friend, Leah, who has a 6th month old and a 2 year old even if I don’t win. I just cheated I think. Haha, David, stirring up trouble already! No, it’s not cheating to leave two comments — you can only press the green button once, and that’s what counts! I am just so touched by your support — thank you, my friend. Please sign me up for the blossoming “Rhymers Trying Prose” support group aka RhyTryPro. Glad to feel/share the pain! What a fantastic resource. Looking so forward to checking in regularly. I am now a subscriber. What a cool contest. I love the fancy copter thingy for keeping track of the entries! Definately will do that when my book launches this June. : ) Thanks for the heads up. Alison – Rafflecopter is quick and easy and free, plus it looks nice. Thanks for stopping by!! Your blog schedule sounds great! Looking forward to the posts on FB. So, glad you are part of 12 x 12. Your experience and insight unpublished authors like ME! Good luck with your blog! Renee, I am subscribed to your blog (love it) and will be commenting on your PPBF for this week. I think I did last week, too. Thanks for the giveaway! Congratulations to Traci, Bambi, and Eric — and to you, Renee, for your blog and for having such a cool “launch party”. Congratulations to all the winners! Great giveaway! 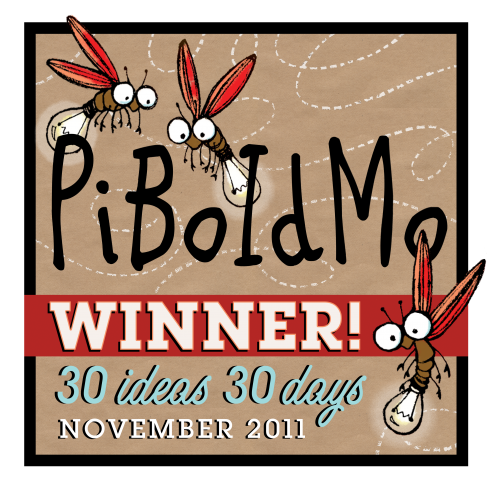 Congrats to Traci, Bambi and Eric, great start for a lovely blog. Hi Renee!!! Wanted to drop a line to thank you for Lizard Lou!!! My son has had fun listening to the poems, and my daughter took the book and read it through the first night we received it!!! I love your web page too!!! I love the poems and love that you have activities attached to the poems :-). Your poems are so fun and exciting!!! We look forward to seeing more from you!!! Thank you!! !